We started off this year at all-time highs for sub-Saharan Africa issuances. Compared to 2017, we have already exceeded what was issued in total in 2017. Just when the SA bonds were being issued in terms of the Eurobond (they were issuing €2-bn), the market seemed to turn on the heightened worry of the Trade War risk between China and the USA. Added to that was the issue of Turkey controlling the Central Bank rates and monetary policy. Then we saw emerging markets feeling a little bit of pressure and Argentina going through an economic crisis. Right now there are talks in terms of an IMF bailout package, which is probably going to be the biggest package the IMF has seen to date, because of what’s currently going on in Argentina. This EM negative sentiment resulted in very limited issuances, post-June. SA had a $2bn Eurobond issue in May so, quite fortuitous timing? From a timing perspective it was the perfect time for SA because post then, the market had been closed until the US$1.5-bn issuance by Eskom on 2 August. Not an ‘if’ SA (the sovereign) had gone to the market now for $2bn, given everything that’s happened since May. Would it have had to pay a higher rate? Yes, I think it would have had to pay a higher rate because what we’re seeing in the rates, given what’s happening in the EM space. You’ll see that in general, from a tracking perspective, if you look at the sovereign track that we do for the African-Sovereign Index you will see that from May it has increased by about 75 basis points. So, they would have actually paid a lot more, from 75 basis points more, given what’s currently happening to the spreads in the sovereign space in the EM market. So, if you start adding that out over a period of the loan it’s a lot of extra money that SA would have had to pay in interest. Does it also stop sub-Saharan African borrowers from going into the Eurobond because they have to pay more? It depends what the objective for the issuers is. For an issuer like SA, the objective is to keep costs at a minimum and raise as much funding as possible. For various other issuers it also depends on the terms of what their key objective at that point in time is. Is the key objective to get size? If the key objective is to get size, regardless of the pricing, you might actually come and issue at that point in time. But if the key objective is to work within a price guide and you can wait for some time until the EM market has actually settled down slightly, then you can come to the market post that. It’s been an extraordinary period of time with Donald Trump’s threatening of Trade Wars and then the developments in Turkey. The rand, for instance, from early June being just over R13 to the USD, now it’s over R15 to the USD, and other emerging market currencies going the same way. From that perspective, I’m sure it would make borrowers a little bit nervous given that they have to repay this debt at some point? Yes. I think the rates have come up but what we started to see is a little bit of ease in the EM market space, from a risk perspective. You mentioned SA, which is a good example, in terms of the dollar rate going from R13 all the way through to R14 to R15. But as you’ll see today, it’s around the R15 level, so, it’s coming down slightly. From a sub-Saharan perspective, there is more other de-coupling versus other emerging markets. We’ve seen similarities in Argentina. Investors are starting to now de-couple these emerging markets and look specifically in the names and be specific in those names. Even from a sub-Saharan perspective the spreads haven’t been as aggressive as in the overall emerging market bond indexes. That’s healthy though? Isn’t it a good thing that emerging markets themselves are now starting to differentiate? Yes, it’s healthy. No one ever wants to be grouped together, because every market has its own uniqueness which is reflected in its pricing. I think the fact that the markets are starting to differentiate the two is actually quite positive. Considering what’s been happening in the other EM space, and the pressures in South America, most investors are now looking for yield in the sub-Saharan space. 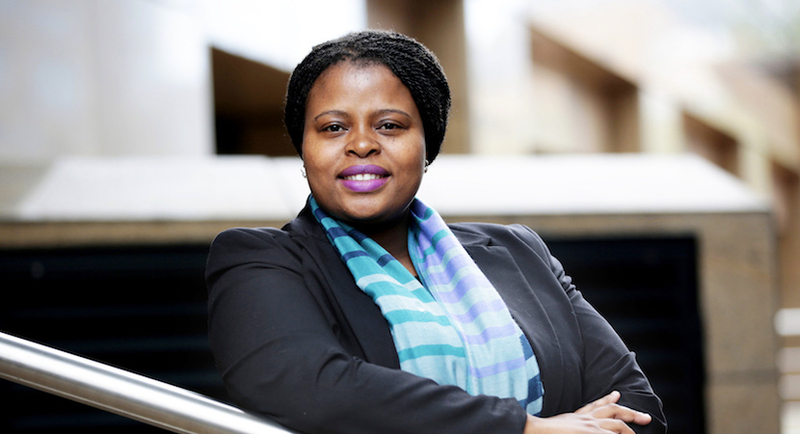 Nanagolo Phiri, Co-head of the Debt Financing Group at RMB. RMB has an operation in London that specialises in Eurobonds. Have they been less busy now that your London colleagues have come back from their summer holidays? Are sub-Saharan African borrowers sitting on their hands or are they still planning? In terms of the Eurobond perspective, there’s been some element of easing as we go into the summer holidays. The emerging market space has also been quite unstable in that we haven’t seen many issuers other than Angola issuing a tap for $500m in July, and then Eskom doing $1.5bn in August. Post the holidays, we are telling our various issuers (clients) that they should prepare themselves to start issuing now. Now is the right time to get your documents ready, appoint your arrangers, appoint your lawyers, etc., so that when the market opens up and the spreads are in the levels that we would advise them to issue at, they are able to move quite quickly to access the window that is open at that point in time. How long does it take to get all the proprietary documentation and so on together? It depends on whether you’re a regular issuer or whether it’s an inaugural issuance. A regular issuance can be done as quickly as they are able to go, from six to eight weeks in terms of reviewing the documents and turning around the documents. If the documents or their programme are up to date, they will move faster. For an inaugural issuer it usually takes a little bit of time, given that there’s a ratings process that they also have to go through. That could take up anything between 10 to 12 weeks. That’s why we always say to issuers that the journey to issuing in the Eurobonds requires preparation. It is therefore important to have people or arrangers, who understand both your markets, your country or company specific industry, as well as the international markets who can help sell your story to the international markets. Of the 53 African countries, which ones are in the market regularly and who might be joining soon? The ones that we’ve seen this year and in the market regularly is Nigeria. This year Nigeria came with a $2.5bn bond-issuance in the 12 to 20-year space. Then Kenya – I think for the past two years has become a regular issuer. Even in the sovereign space, you realise that they can go to much longer tenors than you would typically see in the corporate space, where the corporates will mainly do five to seven, and even 10. In the sovereign space you’ll be able to get to 30, from a market perspective. Your regular issuers are Senegal. FirstRand and a couple of the banks have also issued regularly in the Eurobond markets. Angola, Ghana, SA (as a regular issuer), are also regular issuers. However the last time they issued in the Eurobond space was about four years ago. They’re not as regular as you see in the bigger markets, such as SA, Nigeria, Kenya, Ivory Coast and Senegal. What’s happening in the SA bond market of the debt market itself? We do have exchange control, which I suppose would have, to a degree, shielded the borrowers and the lenders? I think the SA market and clients who are always looking to list inwards into the JSE are always surprised by how the SA market moves because it usually doesn’t move in line with what happens on the global front, from an EM perspective. With all this noise that’s been happening in the EM space, one would think that that would actually carry over into the SA market. But as you’ve mentioned, the fact that we’ve got exchange control, and our institutional market is compelled to actually invest in the local market, cushions it away from what you see in other emerging markets. What we’ve observed in the local market is a strong demand for issuance in the market. Most of the issuances that we’ve brought to the market (being over two or three times subscribed), and even pricing below or at guidance, or the lower side of the guidelines. If you look at what has happened also, in the SOEs – historically, given what has happened in the market is that SOEs were quite regular issuers in the SA market. However, with the governance and the various issues of recent times, in the SOEs, this resulted in the SOEs not being able to issue because of lack of demand from the asset managers, until certain things have been changed in these SOEs. As such, there’s been a lot of hands chasing the corporates and similar kind of entities because the SOEs have not been issuing. Would it then not make sense for other African sovereigns to start tapping into the SA market, given that things are a bit tougher in Europe? I think the issue there would be more of a currency play. From a hedging perspective though, if they could, that would be great. We’ve seen Namibia is an issuer in SA, obviously, from an inward listing perspective and they continue to always look into SA as a market where they can actually issue. Then we have had some interest in some sovereigns to come and look in SA. But to be honest, I think we haven’t really seen this get much traction because they would have to hedge looking at SA. Then there is also the issue of size that they usually require. What they require is quite high so from a market perspective it may not reach the levels that they are trying to reach. I think the SA institutional market, again, unless it’s in the CMA market, will have restrictions, in terms of how much they can put in other sovereign markets. That was Nanagolo Phiri, co-head of the debt financing group at RMB. I’m Alec Hogg. Until the next time, cheerio.